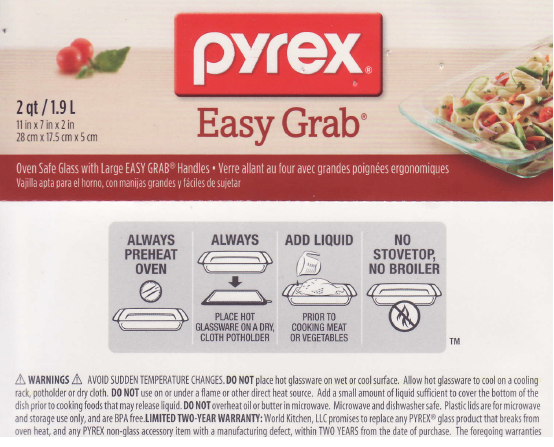 This Pyrex glass safety label says "Always preheat oven". Any idea why? So, if you place a pyrex dish in a cold oven and then turn it on, some surfaces of the dish will be exposed to this intense radiant heat for a long period of time as the oven heats up, while the air temperature in the oven the rest of the dish is exposed to will still be much cooler. If the dish is placed in the oven after it has preheated, it will still be exposed to the radiant heat as the oven cycles on and off to maintain the temperature, but it will be for shorter periods of time and the ambient temperature the rest of the dish is exposed to will not have such a large differential, resulting in less thermal stress on the glass. Assurez-vous de toujours préchauffer le four avant d’y mettre votre plat en vitre. This means, "make sure to always preheat the oven before putting in your pan". It could be interpreted in two ways: "always preheat the oven if you're going to use the pan in it", or: "always preheat the oven before putting in the pan, not after putting in the pan". The latter would make sense: pre-heating is a special function in many ovens with its own button. This function uses the grill on the "ceiling" to make it heat up extra fast (in addition to the normal heating element located outside the internal oven compartment), and this would result in too much direct heat on the pan. The warning in the picture in the Question also says "do not use under a direct heat source". Another (weaker) hypothesis: they interpreted the French correctly. A good oven should not do this, but some ovens may turn on the grill even when heating up the oven normally (non-pre-heating), to make it heat up faster from room temperature. If, however, you put it in after the oven has already reached the desired temperature, the grill element won't be on at full power all the time any more, if at all. My oven only uses the added heat from the grill when I'm pre-heating, so this wouldn't happen—as it shouldn't. But maybe some ovens are crazy. That's just a precaution to extend the life of your Pyrex glassware. Avoid sudden changes in the temperature of the glass. Ensure to always preheat the oven before you put your glassware inside. I think the always-preheat instruction is there so that the cooking time is similar to that of metal pans, rather than for safety. Glass conducts heat poorly compared to metals; preheating the oven fully is one way to make the cooking time stay similar to that of the same dish, in a metal pan. Not the answer you're looking for? Browse other questions tagged heat kitchen-safety glass or ask your own question. Can microwave safe glass vessels be used in an electric oven? Where can I buy borosilicate (Pyrex) bakeware in the U.S.? Are there dangers to using solid fuel on a propane grill? How to avoid vegetables sticking on heat-resistant glass dish? The glass door on my convection oven broke. Can I still use it? Can I take a glass baking dish from the fridge and put it in a hot oven?